Can Video Games Help Kids Eat Healthy? Concerned about your children’s nutrition? The good news is that as long as you provide a wide variety of nourishing foods, their diet will balance out over time. But most of us would like to see our kids enjoy at least a few foods outside of the mac-n-cheese food group. 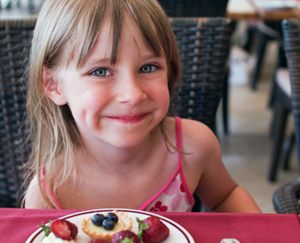 So, here are some kid-friendly foods that are as good for you as they taste. They’ve been selected for their superior nutritional profiles and, with a little ingenuity, are sure to make the “A” list with even the pickiest eaters. The beauty of cauliflower lies in its ability to blend unnoticed into almost any recipe. Nutritional highlights: 1 cup of cooked cauliflower provides almost a full day’s requirement of vitamin C. It’s also high in fiber, something most kids could use more of. Like all members of the cabbage family, cauliflower might help prevent many common cancers. Kids will eat it like this: Steamed, pureed cauliflower is perfect for mixing with other foods like mashed potatoes, soups, and macaroni and cheese. It’s also delicious steamed and crumbled over pasta and tossed with olive oil and seasonings. Mini-recipe:Crunchy Cauliflower – Chop one head of cauliflower into 1-inch chunks. Place in a large bowl and drizzle with 3 tablespoons of olive oil, a teaspoon of garlic powder, and salt and pepper to taste. Toss to mix, then spread out on a baking sheet and cook in a 425-degree preheated oven for 10 minutes, or until the cauliflower starts to get a brown crust on it. Turn once during roasting for a nice crunch on both sides. A perfect finger food for tiny eaters, blueberries usually go on to become life-long favorites. Nutritional highlights: Blueberries are antioxidant superstars, protecting the body from free radical damage that can lead to premature aging, heart disease, and cancer. They’re packed with vitamin C for immune health and fiber that can help keep kids regular. Berries of all kinds may help combat allergies, as well. Kids will eat them like this: Fresh blueberries are always a favorite, but imported or froze are easy to find all year long. Add them to smoothies, pancakes, muffins, desserts, and even salads. Mini-recipe:Berries & Cheese Cream – Place 2 cups of frozen blueberries, eight ounces of ricotta cheese, ½ cup pure maple syrup, and 1 teaspoon vanilla in the food processor. Mix until smooth and serve immediately. This recipe has considerably less fat per serving than regular ice cream (4 grams in Cheese Cream versus 18 grams in the average serving of ice cream). The darker the bean, the more nutritious it is, elevating black beans to the top of the superfood list. Nutritional highlights: Black beans pack the same antioxidant wallop as cranberries. Their protein and fiber content help balance blood sugar and provide growing bodies with long-lasting energy. One cup of black beans also supplies about 20% of your child’s iron needs for the day. Kids will eat them like this: Black beans can be added to chili, pureed into a dip with garlic, tomatoes, and cilantro, or mixed with scrambled eggs. Mini-recipe:Black Bean Quesadilla – Spread a thin layer of black beans on half of a tortilla shell, toss on some Monterey Jack or other mild cheese, and sprinkle on a bit of garlic powder and garam masala (an Indian spice blend). Fold in half and heat in a panini maker or flat-bottomed pan until cheese melts. These prepackaged powerhouses provide high-quality nutrition at an affordable price. Nutritional highlights: Eggs are a great source of choline, an often overlooked but essential nutrient for brain and nervous system development. They’re also high in protein and are a good dietary source of vitamin D.
Kids will eat them like this: Since eggs can be added to virtually any baked good, chances are your kids are already enjoying them. Look for muffin and pancake recipes using several eggs, and experiment with omelets and frittatas. Popular combinations include: zucchini and basil, onions and potatoes, and tomato, mozzarella, and ham. Mini-recipe:Very Eggy French Toast – Use one egg per slice of bread and mix in just a splash of milk, a dash of cinnamon, and a pinch of salt. Serve with blueberry syrup (1 cup of frozen blueberries heated with ½ cup maple syrup). Spinach is another highly nutritious food with nearly endless masking possibilities. Nutritional highlights: Spinach is an excellent source of vitamins A, C, and K for optimal immunity and bone health. It’s also high in iron and several B vitamins, and boasts anti-inflammatory and antioxidant properties, making it a winner for heart and eye health. Kids will eat it like this: If your child likes the flavor of pesto, replace half of the basil in the recipe with fresh spinach. Use as a sandwich spread, pizza topping, or pasta sauce. Frozen chopped spinach is perfect for adding to meatballs and the puree can even be added to sweets like brownies. Mini-recipe:Cheesy Green Pasta – Sauté an onion in 1 tablespoon of olive oil, then add 6 ounces of fresh spinach, a grated zucchini, and 1 teaspoon of garlic powder. Once the spinach wilts, add 8 ounces ricotta, ½ cup grated Parmesan, a dash of nutmeg, and salt and pepper to taste. Blend in food processor and mix with 12 ounces of cooked pasta. Remember, keep on trying! Don’t assume that your kids will never like something if they’ve tried it once and dismissed it. Tastes change over time; give your children the chance to grow into their own healthy way of eating.